We had an eggplant to use up and had been planning to make a vegetable lasagna, before we found that we’d forgotten to save some mushrooms, peppers and a few other things. In short, the recipe was limping along on some eggplant and pasta noodles. Something had to be done. I suggested my favorite eggplant dish: Eggplant Parmesan. My husband shook his head – he had his heart set on pasta. And so, he found this recipe and I cooked and you can read about it. Once I’m done, I’ve promised myself a glass of mulled wine, so I’m going to stop here so I can go have a glass. Or two. Enjoy. Start a medium pot of water boiling. Over medium-high heat, cook sausage in a large skillet until browned (about 6 – 7 minutes). Remove to a large bowl. Cook eggplant with a drizzle of olive oil until soft and tender, about 6 – 7 minutes. Remove. Cook wheat penne according to package directions or for approximately 11 – 13 minutes, until al dente. Drain and remove to the bowl of sausage and eggplant. While pasta cooks, saute collard greens with a drizzle of olive oil until tender, about 5 minutes. Remove and toss with other items in the large bowl. Combine the diced tomatoes, garlic, oregano, pepper and tomato paste in the skillet. Cook, stirring occasionally, until thickened, about 3 – 4 minutes. Toss the sauce with the pasta and everything else. 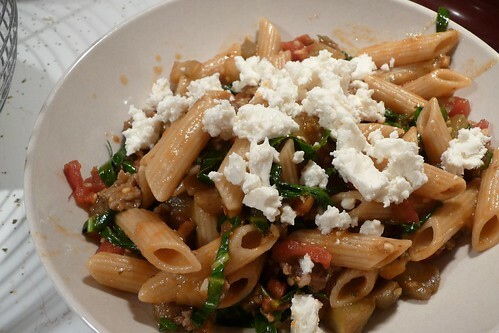 Spoon into pasta bowls and crumble some feta cheese on top. This entry was posted in ground meat, italian, pasta, pork, recipes, untranslated. Bookmark the permalink.